Most racquets have a recommended tension range, with lower tensions giving more power and comfort, while higher tensions augment control. Typically, tensions range between 50 pounds and 70. When you give your frame to a stringer for re-stringing, you — possibly with his help — will decide on what tension to use. This is called the reference tension. If you've had your frame re-strung by different stringers, however, you know that even with the same frame, the same string, and the same requested tension, the racquet can seem completely different when you get it back. The reason for this is that there are many factors that can influence the finished results in a string job. Different machine configurations produce different end results. For example, a machine’s tensioning and clamping systems are major contributory factors. 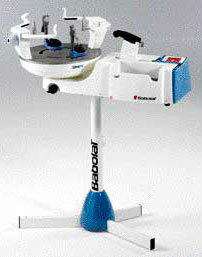 Electronic tensioning machines (such as the Babolat Star 5 that I use) will produce a tighter finished string-bed (less deflection) than a manual lock-out tensioning machine, for the same given reference tension. A 6-pound reduction in reference tension for an electronic machine is a rough guesstimate for a player who is used to manual machine settings. This is not to say that one type is necessarily any better than the other, just different, and something the player needs to be aware of when having a racquet strung. The clampings are relied on to maintain the tension on one string while working on the next string, and is a crucial part of the overall consistency of the string job. Good clamps hold the string by gripping, not crushing and often have sapphire-, diamond-, or tungsten-carbide-dusted faces. The clamps and clamp bases can be swivelled 360° and lock onto the machine turntable for stability. Bottom-end machines usually come with flying clamps, these are not fixed to the machine. They can be inconsistent at best and notoriously inaccurate at worst. The strings lengths are shorter, therefore deflect less under the same load. They are packed into a smaller area and each string is giving the next more support. Generally speaking, a racquet with a larger head will have a softer string-bed tension than smaller one, which is why larger racquets often have higher recommended tensions. Frames with low string-bed density (i.e. 14 mains, 18 crosses) will exhibit a lower finished string bed tension reading than the same frame with 16 mains and 20 crosses, strung at the same tension in the same string. This is because more string is packed into the same area in a 16 main/20 cross racquet resulting in the strings spacing being closer, which means they are more supportive of one another. Some strings are more elastic than others and will stretch more under a given load. The elongation value of a string is usually expressed as a percent at 60 pounds tension. A piece of string 10” long that stretches to 11” when 60 pounds is applied is said to have a 10% elongation value at 60 pounds. After stringing, high elongation value strings tend to exhibit a lower string-bed tension readings as less of the available stretch is taken out during the processes. Other strings such as aramid (Kevlar) and polyester have very little elongation, so the string-bed tension reading will be much higher and therefore will feel tighter than the more elastic strings strung at the same tension. As an MRT (Master Racquet Technician) I have demonstrated practical expertise in all racquet service areas, plus an understanding of racquets, strings and customizing techniques.